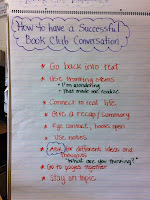 Yesterday, Mel asked the students to turn and talk during the reading workshop mini-lesson. One of the relatively precocious girls in the room looked at her partner, gave the question some thought and said, “I have no idea.” Her partner laughed and asked this child where she thought she became confused. Then, the parter launched into her theoretical answer to Mel’s question. As I watched this interaction, both girls contributed meaningfully to the conversation and the initial sense of confusion dissipated. In our class, we try to honor students when they integrate an unfamiliar skill, push themselves beyond their comfort zones, or experiment with new learning. I think that this child was a little surprised that she was the object of my honor after the students finished their conversations. In The Global Achievement Gap by Tony Wagner, he writes that “the habit of asking questions was most frequently mentioned as an essential component of critical thinking and problem-solving skills.” Extending this concept, students need to be able to assess what they understand and where their understanding breaks down. Then, they have to be willing to admit that they don’t know something and formulate a question so that they do. Do I understand the concepts, objectives, or overall lesson? If I don’t, when did I stop understanding? In reading, when did my “picture become fuzzy?” In writing, when did I stop knowing what I was going to say or how it relates to the main idea of my composition/story? In math, what skill is holding be back from being able to solve the problem? How can I formulate a question that will clarify the information for me? We really discourage students from saying, “I don’t get it.” We want them to ask the question that targets where they don’t get it. Who can I ask or where can I go to find the answer? Students have access to resources far beyond the classroom teachers. We teach them to be critical consumers of information and also to use each other for collaboration and assistance. Self-monitoring and asking questions are such important skills for students at all levels. What are other teachers doing on a daily basis in their classrooms to help students develop these skills? For about the past 10 years, I have tweaked or created a whole new note-taking system each year to keep track of all my conference notes from my reading and writing workshops. I have used notebooks with a tab for each student, a binder with double spread pages displaying a box for each student to view whole class at one time, a binder with a tabbed section for each student with blank pages to stick the labels I used to write my conference notes, and the list goes on. Regardless of the system I used, I always used the same template of recording the "Compliment/Strength, Teaching Point, and Next Steps." Last year, I was intrigued by the iPad so I finally went out and purchased my own when I discovered the Confer App existed that had the same template that I have been using on paper all these years! After going on YouTube to view one of the Confer app tutorials of a teacher demonstrating step by step how to use the app to take notes on individual students and small groups, I was even more enticed and the decision to purchase an iPad was final. Although the Confer app now costs $14.99 (I paid $10.00 when I bought it last year) it is worth every penny! The Confer app enables you to import your class list multiple times so you can make a section for each subject area where you take notes on students (i.e. reading workshop, writing workshop, math, behavior, etc.). You can take notes on individual students using the template of "Tag, Strength, Teaching Point, and Next Step" or you can take general notes without a template. It also lets you view your students by name, date, reading level, tag, strength, teaching point, or next step. This allows you to easily see who you haven't conferred with in awhile, help plan instruction based on similar needs, and form small groups based on common next steps. When I used to use a paper and pen system, I always had difficulty finding an efficient way to take notes on my small groups because I found myself writing the same teaching point and information four different times (once for each student in the small group). This is a non-issue now with the Confer app because you can check off the box in front of the four students you are meeting with in a small group and when you hit "add note" in the top right corner of the screen, it brings you to a small group page. This small group page has the same template used for individual conferences, but this time all the notes you type in automatically goes into each individual students section so you only type it once! This is such a timesaver and makes my notetaking more efficient and effective. The confer app also lets you email the data to yourself or to another colleague which makes sharing data with others much easier. You can also upload your data now to a gmail account so you can make a spreadsheet of your notes too. I absolutely love using the Confer app and am very grateful to David Lowe who developed it! If you haven't checked out this app yet, I highly recommend watching the YouTube videos or the tutorials and description of the app in the App Store. 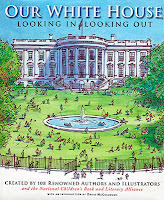 On Saturday, Mel and I drove to New York to attend the Teachers’ College Reading and Writing Project Saturday Reunion. I had never been so I wasn’t sure what to expect. Mel had been working on me for weeks to go and I agreed since it was actually a relatively light weekend for my family’s activities. (We are mercifully between sports and theater productions at the moment!) Together, we went over the workshop offerings; we split up so that we could get more information and share it so we had to agree on the overabundance of workshops that interested us. Janet Steinberg, a literacy coach in the Bronx before joining the TCRWP as a staff developer, presented The Integration of RTI, Reading Workshop and the Common Core. I have four pages of notes from this 45-minute session and I won’t try to include them all in this post. Instead, I am reflecting on the six things that she talked about that we need to teach our students as readers. It’s amazing to me how complicated making a prediction is for students but at the core of a prediction is an inference. If a student is thinking ahead about what could happen, then s/he is thinking about more than what is explicitly in the text. The students who struggle with reading (and these are the ones I focus on since I am the Special Education teacher in the classroom) struggle to make meaningful predictions. For some of them, decoding requires so much energy that thinking beyond syllables is a Herculean task; read alouds are critical for these students so they develop thinking skills and understand that we can learn and think about books well beyond the words on the page. Janet wondered out loud how many of our students really read during reading workshop. I’m in the regular education classroom every day for reading workshop and the students who love to read and are good at it spend their time reading. Our reading engagement inventories (see Mel Swider’s post yesterday about Jennifer Serravallo's workshop) provide meaningful data that our struggling readers are not as engaged. They are talking, jotting notes, choosing a new book, asking questions, going to the bathroom, looking out the window, finding a comfortable place…they aren’t reading. My students need explicit instruction about how to initiate the reading process and then progress monitoring for how long they can maintain reading stamina. Can I picture what is happening in the text? Do I know the names of my characters? Can I give a quick retell when I reach the end of a chapter? If there’s a cliff-hanger or turning point, can I explain it? I teach them that if they can’t answer these questions, it’s their responsibility as readers to review the text, figure out where they began to struggle and figure out how to clarify it. Building a relationship with a book. This is another one of my favorites. Whenever I read a really good book, the rest of my life suffers. I miss the characters when I finish the book. I read The Fault in our Stars a couple of weeks ago and I still miss Augustus and Hazel. Janet pushed my thinking about relationships with books in that she talked about non-fiction books and the need for students to get information from books and recognize the purpose of reading. and what some of the common issues or structures are that exist within and across genres. As we read increasingly more non-fiction in classrooms, we will have to continue to hone this set of questions. What are some of the questions that will help students to think across informational and other forms of non-fiction texts? So, this was about a third of a page of the four pages of notes that I took during one of the four workshops I attended on Saturday. If anyone out there is ever able to make an upcoming TC Reunion, they are highly worth the day in New York! Years ago, I met Jennifer Serravallo through the pages of her book, Conferring With Readers which gave me new insights into conferring. It also helped me coach other teachers on their own conferring. I’ve attended many of Jen’s workshop sessions at Teachers College over the years on conferring and small groups so I was thrilled when I heard she was writing a new book on Teaching Reading in Small Groups. Of course I bought it as soon as it came out last year and tagged parts with multiple post-its and notes. This year, our school is focusing on strengthening our small group instruction across grades and subjects and are reading Teaching Reading in Small Groups as a school book club. So when I saw that Jen Serravallo was presenting a session at the TC Saturday Reunion titled: Using Quick Assessments to be sure our small group work in reading has traction, I added it to my list of sessions! In addition to her two professional books, Jen Serravallo recently published Independent Reading Assessment which is a new assessment resource through Scholastic. During this session, Jen talked about the many different forms of assessments that can be more powerful and informative than formative pencil and paper tests. · What is it about this series or author that you like so much? · Hmmm…I’m noticing that you are reading more when you are home than in school. Why do you think this is? I began using this inventory in my classroom when I read about it in her book, Teaching Reading in Small Groups and it is very informative! Once you notice and make note of the avoidance behaviors, you can create and pull small groups to teach them strategies that can help strengthen their stamina and engagement as readers. One of Jen’s ideas is to have students create a portfolio page of post-its for each marking period to show their individual comprehension continuum and growth in specific comprehension skills. Three times a year (beginning, middle, end of year), give students four specific prompts to jot down their thinking while you are reading aloud. They jot down their thinking on individual post-its that you will collect at the end of the read aloud. When you are finished sorting and forming the small groups, you can give the post-its back to the students so they can tape the four post-its onto a sheet of paper with the title of the book, date, and each post-it labeled with the skill (i.e. prediction, question, theory, etc.). These papers go into their reading portfolios and by the end of the year, you will have three examples to help see the students’ growth in comprehension skills. Each year I look forward to the months of October and March so I can spend the day at Teachers College Reading and Writing Project at their Saturday Reunion. This day always leaves me energized and eager to go back to my classroom to try out new ideas and at the same time reaffirms what I already have in place in my classroom and in my teaching. The night before the reunion, I always get comfortable with a colored pen in one hand and the workshop schedule in the other to underline and star the workshops I want to attend. One workshop that I always look forward to each year is the one led by Rob Ross on “New Book Titles” for read aloud and to use as mentors in writing workshop. Of course this workshop always leads me to a trip to the closest bookstore or a visit online to Amazon to buy the titles I don’t already own! Dear Hot Dog by Mordicai Gerstein is a poetry book about everyday things such as socks, toes, toothbrushes, pants, and more everyday objects. The poems don't all rhyme and the word choice is specific. 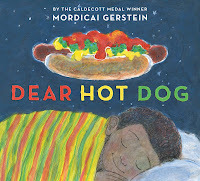 This is not only a great poetry book to read aloud and enjoy with kids, but also a perfect poetry mentor for them to use as they write their own poems since they can write about everyday objects and living things in their own lives! 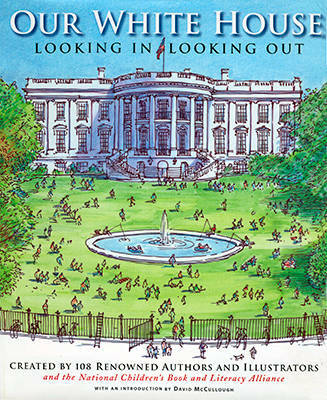 Our White House Looking In Looking Out by 110 Renowned Authors and Illustrators such as Kate DiCamillo, Jon Sciezka and many more. It is picture book that includes essays, actual speeches, letters, memoir, poetry, fictional stories, transcripts of interviews, and much more! This is definitely going to become a favorite for many students who love trivia, history, facts, and stories! 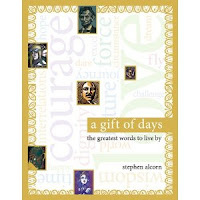 A Gift of Days: The Greatest Words to Live by written and illustrated by Stephen Alcorn is a book full of quotes for each day in the year. It starts with January 1 and continues on with a total of 366 quotes by Maya Angelou, Steve Jobs, Oprah, Martin Luther King Jr., and many more noteworthy figures in the world. I can’t wait to purchase this book and begin reading a quote a day at morning meeting – so powerful to talk about the meaning of quotes with our students! 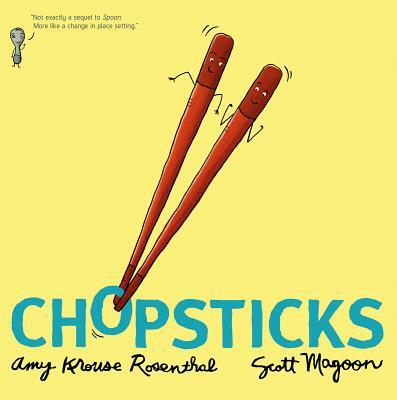 Chopsticks by Amy Krouse Rosenthal is a hysterical picture book that would be ideal for read aloud to enjoy the play on words together! If you enjoyed reading her other books, such as Spoon, then you will absolutely love this one! 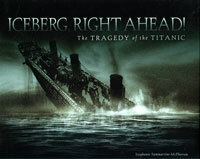 Iceberg Right Ahead: the Tragedy of the Titanic by Stephanie McPherson is a Narrative NF book about the Titanic that includes photographs, anecdotes, trivia, and interviews. The 100 year anniversary of the tragic sinking is approaching. Chloe and the Lion by Mac Barnett is a humorous picture book that reminds me of Knuffle Bunny. It will be a great mentor for students to use while they are writing fictional stories with strong characters and diaglogue. This title will be released on April 3rd. Should We Have Pets? 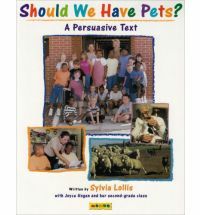 by Sylvia Lollis with Joyce Hogan and her second grade class, is a persuasive text that is similar to Should There be Zoos by Tony Stead. In this book, a second grade class presents arguments for and against owning a pet. I see this as being a perfect mentor for students who are writing argumentative essays, persuasive essays, and learning how to debate respectfully with others. My eighth-grade daughter is at The Hunger Games as I draft this post and I really want to write some of my thoughts about this book before she comes home and tells me all about the movie. I'm sure that she is in a crowded movie theater because in one of the classrooms I service, all of the fifth graders were talking about their plans to go see the movie. Fifth graders. I'm struggling with this. I read the book last year when curiosity overcame my workload; the amount my daughters were talking about The Hunger Games inspired me to read it. I admit that I was completely hooked within the first twenty pages and I finished the book in two days. My full disclaimer is that I am looking forward to seeing the movie this weekend and I will probably revisit some of the book since I love to compare books and movies. As an adult, I appreciated Katniss's heroism and her ultimate moral dilemma. I also recognized the political themes of The Hunger Games. The government maintains complete control over the citizens by exploiting the children. The annual lottery to select children to kill or be killed by each other has odds that increase, depending on how much families must ask the government for food. I cheered for Katniss in the final scenes and I was relieved and proud of her ultimate decisions. All of that being said, this book's plot is about children killing children. It's about children killing children. Additionally, the murders are televised throughout the country as a reality television show that is required viewing for all citizens per order of the government. Around the country, the viewers are cheering for their districts' representatives so they celebrate the deaths of children from competing districts. My daughters have smart friends. Their friends read a lot and do well in school. I asked these eighth graders what they thought the book was about. One response I heard from an exceptionally bright girl was "it's a fantasy book about kids killing each other." I challenged her claim that The Hunger Games is fantasy. Is anything in this book beyond the realm of possibility? She wasn't sure. It's futuristic and that's different from fantasy. Okay, maybe the final scene with the dogs could render the book fantasy and the tree climbing was extraordinary, but people in The Hunger Games don't fly or walk through walls or find a world behind the bedroom closet. Children compete in a game that the government orchestrates and televises with impressive technology. Last year, Jared Lee Loughner opened fire on people in Tucson, killing six and shooting a total of nineteen people, just after I finished The Hunger Games. Just recently, 17 year-old TJ Lane killed three high school students in Ohio. Our children are exposed to significant violence in their daily lives and as adults we wrestle with the morality of killing. In Connecticut, our lawmakers are on the verge of repealing the death penalty amidst great controversy; we have, among others, two death row inmates who murdered a mother and two daughters in a home invasion. Educated adults can't agree whether putting these two men to death is appropriate but several of my fifth graders are reading about teenagers being forced and then encouraged to kill each other. We aren't necessarily spending time with them to talk about the political elements or the morality issues; they just like the concept. I'm going to need serious convincing that this book belongs in the hands of elementary students. Is Katniss a strong female heroine? Absolutely. But I worry that children will see her as a heroine because she is the most successful killer in the book. It seems to me that there are many contemporary literary role models for girls who are not wielding knives and arrows. I can think of Melody in Out of My Mind, Turtle in Turtle in Paradise, and Claire in Sugar and Ice, just to name a few. Anyone out there want to add to my list? I'd love it! On our way to the TC Saturday Reunion! We are off to Teachers College for the spring Saturday Reunion! For those of you who may have never experienced the TC Saturday Reunion , it offers hundreds of workshops so you can choose which ones fit your needs and interests. There are four different time slots to attend workshops during the day so by the end of the day, you have attended four different workshops on a variety of topics of your choice! Melanie Meehan and I will be posting all of our new learning, thinking, and reflections from the workshops for the next few days so stay tuned! None of my students generally like to work on spelling. However, I have a new app on my iPad that has changed this sentiment. This week I am writing about Spelling Hero. When I first got Spelling Hero, it was $.99 but good news for anyone who wants it--the price dropped to free just last week. Spelling hero has several pre-loaded spelling lists but you can also customize lists for specific users. The program allows each user to create their own profile and their own words. Once the words are entered in, Spelling Hero has a "look up" feature that enters in definitions and pronunciations. Additionally, students are able to record their own voice. This feature has definitely motivated some of my more resistant spellers. 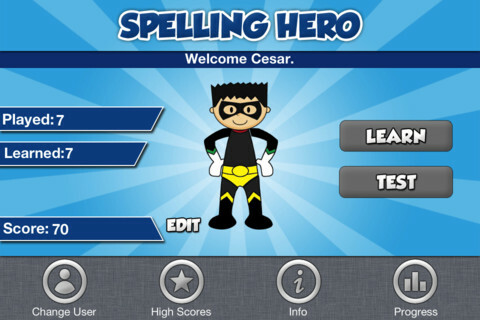 Spelling hero offers a practice mode and a test mode. When the students practice, they see a string of flashcards that the program sets up for them. When the students move to test mode, they hear the word that is pre-recorded and then they have a keyboard for spelling. The program gives them immediate feedback as to whether they spelled the word correctly. My students with encoding goals have learned how to delete words from their lists when they demonstrate mastery of them and how to add new words. This way they are initiating and engaged in their own learning processes. They are a part of their own assessment and development of goal setting. For monitoring progress, Spelling Hero contains a progress feature where I can look at students' success rates. From there, I can star specific words or plan for extra practice. This has been a great app for motivating and inspiring students to learn sight words and I have seen struggling spellers make tremendous growth on this program and generalized to their own writing. Yesterday I was in my Pilates class and for some odd reason, my pilates instructor was only giving verbal directions for the positions rather than demonstrating the positions and modeling the movements. I found that it was taking me longer to get into the proper positions and to do the correct movements because I kept looking around me to see what everyone else was doing to make sure I was doing the right move! I realized how our students must feel when we give them verbal directions and explanations in our teaching rather than provide them with specific roleplaying and modeling. Roleplaying and modeling for our students is so effective because it gives them the explicit visual they may need to grasp the concept and internalize it. Since I am a firm believer in modeling for my students as often as I can, I love doing "fishbowl" conversations with my class so they can see a successful conversation in action. If you are new to this term, a "fishbowl" conversation is when a group goes into the center of a circle to model a successful conversation. The other students sit in the large circle around the group and are the observers; they take note of what the center group or partnership is doing to have a successful conversation. After a few minutes of observing the conversation, students share what they noticed and we chart their noticings so they can use it as a reference when they are having their own conversations. Today was our first day for book club conversations in our Social Issue Unit so Melanie Meehan and I modeled how to have a successful conversation inside the "fishbowl". I told the students to watch us carefully to see what we are doing and saying in order to have a successful conversation and to expect that we will ask, "What did you notice?" at the end of the "fishbowl" like we always ask after a demonstration/roleplay. After our conversation, students shared aloud what they noticed and we charted their responses on chart paper so they could use it as a resource when they have their own book club conversations. 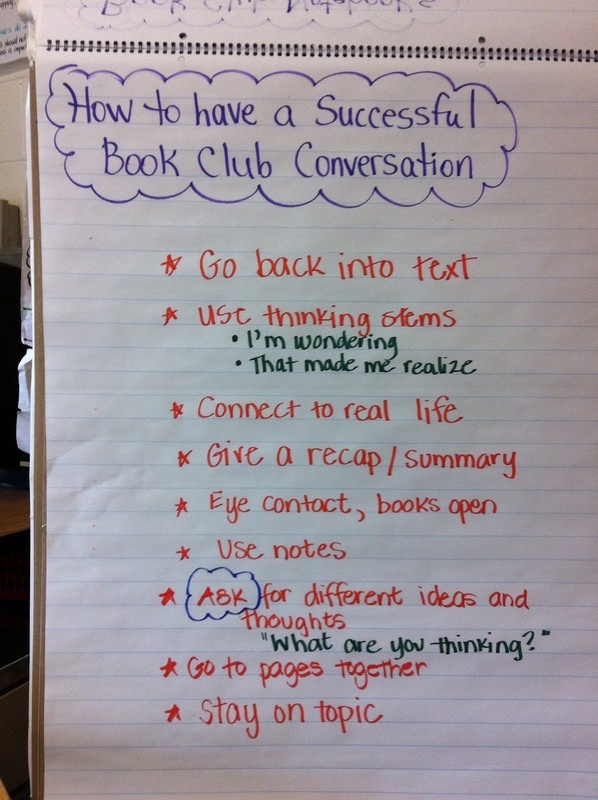 After the minilesson, students went off to have their own book club conversations for the first time and they ran more smoothly than they probably would have without our explicit modeling. We will have another "fishbowl" conversation tomorrow with a book club doing the modeling this time instead of us so the students can see one more example. Hopefully next week, my pilates instructor will be back to her usual teaching techniques of modeling instead of telling! Over the last years, I have participated in several discussions about what students really need to learn in school. As a Board of Education member, I helped to craft a new mission statement and a vision of the graduate for our district. As a graduate student, my professors structured several conversations and assignments around the necessary components of education. As teachers, Mel and I reflect often on how we can incorporate learning dispositions into our curriculum. How does this book/event inspire us to act in our lives? How do you think the character/person feels? Why did the character/person behave this way? What makes you think that this is what the character/person was thinking? Where do you become confused? How have you revised your thinking? What are you proud of about your work? What do you think needs more development/work/attention? What other ways could we solve this problem? How can you connect these different ideas? What presentations can we develop to relay this information? How can you explain your thinking? How did different input and ideas help you to solve the problem or develop your response? How does another viewpoint change your opinion/thinking? This list is far from complete and it is one that we will continue to develop. If anyone has suggestions and ideas for other questions within these categories, we'd love to include them. We're also working on developing activities and behaviors that foster these skills in elementary-aged students. When I was a student in school, I repeatedly asked, "Why do I have to do this? When will I ever use this?" I'm sure I'm not the only one out there who asked these questions to their parents and/or teachers. When I became a teacher, I made a promise to myself to always make the purpose of "why?" we are doing something clear to my students so they can understand the importance and the value in what we are doing. My teachers, unfortunately, rarely made that clear to me so I was left to figure it out myself when later in life, I really did use those skills I learned years ago. So for each unit that we immerse ourselves in, I make the time to discuss the purpose with students and create a chart listing their ideas for "why?" we have this unit of study and what is the purpose. Trust me, I know that time is of the essence in the classroom, but this is time well spent because the students' engagement and motivation levels increase when they understand the purpose of "why" they are doing it. When I stop and think of myself as a learner, I also put forth more effort and motivation towards a task when I understand the purpose of why I'm doing it. Tomorrow's minilesson and conversation will begin to focus on identifying what we need to do as readers and book club members in order for all of the above statements to come true. I'd love to hear other examples of how you share the purpose of lessons and/or units with students so they understand the "why" behind it and see its connection to real life. 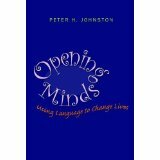 Over the last week I have read and re-read Opening Minds by Peter Johnston. I have read a few books that have dramatically changed the way that I interact with children and think about education. Mindset by Carol Dweck is one of them. The Global Achievement Gap by Tony Wagner is another. I could list some others but Opening Minds is right up there. Johnston talks about fixed and dynamic-learning frames, emphasizing that the latter leads to children believing that they can learn and that they are not limited by their own pre-determined intelligence. In his earlier book, Choice Words, Johnston emphasized the importance of supporting students for process and for praising specific behaviors, eliminating the more generic "good job" phrase from classrooms. This book is full of quotes and anecdotes; one of my favorite pages of Opening Minds is a comic of a dog lamenting that he is always a good dog and never a great one. When we say good job to one student and then excellent job to another (I admit it--I'm sure that I have done this in my quest for positive reinforcement) then we indirectly say to the first student that their job was only good and not excellent. We will be discussing this book as part of our professional development day on Friday and I am really looking forward to hearing what resonated with other readers. Johnston has amazing passages and insights about the importance of social imagination, empathy, classroom conversations, and self-reflection. Writing this post has inspired me to revisit some of my favorite passages and I have continued to reflect about this book and my own practices. I can't wait to hear how others internalized and are incorporating some of the ideas from Opening Minds into their classrooms and their lives. I began my teaching career at a residential school for emotionally disturbed children. Even though I came to think of my students as emotionally deprived as opposed to disturbed, they were a tough group and I spent many afternoons wondering if I should return to my minimally stressful and relatively lucrative waitressing job. In my first few weeks, my principal brought my attention to the school wide behavior plan that he had crafted and we spent some time talking about the first step. The first step, he had written, was to "provide information about the behavior." At the time, I did not realize the subtle shift of power that this first step meant for students. My reflexive response had been to tell these students to stop their disruptive behavior immediately or go to time out. However, I was a novice teacher and I had been given a clear direction from my supervisor that seemed easy enough to implement so I followed his direction. I discovered that this strategy empowered me because I knew exactly what my first phrase to address disruptive behavior would be. When students in the room began to act out, momentary panic set in for me so I was relieved to have a fairly reliable phrase to use--you are calling out, you have not filled out your point sheet, you haven't joined us in the morning circle. All I had to remember was to verbalize what the student was or wasn't doing. The next steps were trickier since they involved asking for the behavior to stop and providing a potential consequence that I had a chance of being able to implement. However, by providing students with information about their behavior, they had a choice about whether to continue or stop. The element of control and the potential for a power struggle was minimized and I found that I didn't always need to suggest consequences. Yes, the difference was subtle but aren't many aspects of language? I have never forgotten the importance of providing information as the first step of behavior management. It has helped me through many parenting moments-- your skirt is very short, you've watched a lot of television, you haven't practiced piano yet, your room is a mess. I've also continued to use it in my classrooms and schools--you're running in the hallway, you are calling out, you haven't started reading yet, you haven't filled out your homework planner. Throughout the school day, we, as teachers, ask for a lot of compliance from students and yet, many goals and mission statements speak to developing independent, respectful citizens. Providing information to students gives them practice at making decisions for themselves. They have an opportunity to reflect on their behavior and decide for themselves on changes to make. Language is powerful for so many reasons and I am constantly searching for ways to use words to empower students so that they develop self-awareness and personal management for successful citizenship. We use these thinking stems across the day in all lessons, conversations, writing, and read aloud. These stems appear to be simple, but they are powerful (remember, some of the best things come in small packages!). Rather than me writing these stems on a chart and posting it in our classroom where it could gather dust and never be looked at, I hand the ownership of creating the stems over to the students. I have a conversation with them about what a "thinking stem" is and give them a couple of examples. Then I have them turn and talk to brainstorm some other possibilities. We talk about the purpose of the thinking stems and students realize how the thinking stems can deepen and extend their thinking to higher levels. Once we generate a list of about ten thinking stems, students volunteer to write one of the thinking stems on white oaktag, making it colorful and decorating it with illustrations. I hang these decorated and personalized thinking stems on our walls where they stay all year and we continue to add to the walls throughout the year as we develop new and revised thinking stems. Since the students make the thinking stems, they truly use them daily as a reference when they are turning and talking with partners, having whole class conversations, writing about their reading, writing during writing workshop, and during lessons. When students have conversations with their partners, partner 1 will share his/her thinking while partner 2 will give thinking stems as prompts to push his partners thinking to higher levels - the students love doing this because they feel like the teacher! The students also love to give me thinking stems while I am thinking aloud about a read aloud or modeling my thinking during a minilesson - they try to stump me and love watching my wheels spin to think of how to use the stem to lift the level of my thinking :). While writing about their reading or working on a writing piece, students use thinking stems as a visual strategy to deepen their thinking and grow their original ideas. For example, they write an idea on the top of the page and continue to build upon the idea by using arrows and thinking stems. This shows them how they can begin with one idea and end up with a new and more complex idea. Last week I wrote about Showme, an incredible app for getting students to explain their thinking. My next featured app is Fourth Grade Math: Splash Math Worksheets. I initially began with the lite version and I purchased the full version for $9.99, a steeper price tag than I generally pay for apps. It has been worth every penny. Splash Math has several categories that include place value, basic operations, fractions, decimals, measurement and geometry. Within each of the categories, there are several levels of activities that students can complete. One of my students had been struggling with understanding fractions. I was constantly drawing pictures for her and looking for manipulatives to help her. This app has specific activities that provide visualization and interactive models. Additionally, I am able to track her progress as she works through sets of activities. Each set has between 20 and 25 questions and the app provides a scratch pad that students can use as needed to perform calculations. When students begin to work on Splash Math, they choose an avatar and establish a personal profile. When they work on it, they sign in and the program logs, tracks, and monitors their progress. Within the controls, I can see usage, generated recommendations, and graphs of their progress. I can also assign them specific activities to do. I have even signed up to have reports emailed to me so I receive weekly reports for each student who uses Splashmath. I have not deeply explored other grade level versions of the Splash Math programs and apps. If anyone has and can attest to their usefulness, I'd love to hear from you. Additionally, the program had an issue with iOS 5.1 and the makers are issuing an update this week so this should not remain a problem. As a teacher of upper elementary students, I am also looking forward to programs for fifth and sixth graders that may be created in the future and I hope that they will reflect the impending Common Core Standards. Since read aloud is a time for us to think aloud and model how to actively use comprehension strategies while reading, it is critical to spend time planning our read alouds. It's a powerful opportunity to show students that readers use strategies as they read in everyday life not just in reading workshop. Read aloud is a time for students to also practice using the comprehension strategies we teach in mini-lessons, conferences, small groups, and by watching us think aloud during read aloud. The students practice these strategies by turning and talking to their reading partner & stopping and jotting on a post-it or in their readers notebook. Every summer, I create a chart with each unit of study on one side and possible read alouds on the other side along with a third column for strategies I would like to model in the read alouds. Of course I always add to this chart throughout the year as new books become published! When it is time to begin this chart of possible read alouds for the year, I put a lot of thought into choosing a text that is aligned to the unit of study in reading workshop, will capture the students’ interest, and allow them to think deeply as readers. 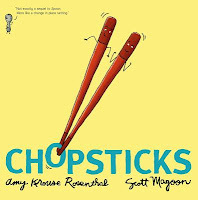 I always have a couple possibilities for chapter book read alouds because I prefer to read aloud chapter books that my students haven't read before. Of course, I believe strongly in the benefits of rereading books, but I like to read "new" chapter books to students so it builds the natural excitement and suspense that come along with reading a new book to see what our characters are going to do next in each chapter! 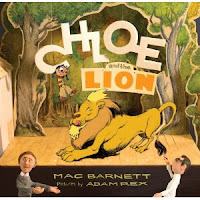 For picture book read alouds, I don't obsess over making sure that it is a new book because picture books are powerful to reread to students to see all of their new thinking and how they are responding to it through a different lens. When I am getting ready to read aloud a book, I carefully find spots within the text to model my own thinking and strategies I used as a reader while I read the book to myself. I am a firm believer that students need to see me as a reader and be able to peek into my mind at the strategies I am using by listening to me think aloud and watch me grapple with the text and characters. After I mark places with post-its with my own thinking, I identify parts for students to turn and talk & stop and jot. I think of what I want them to turn and talk about and jot the “prompt” on a post-it and stick it on the page as a reminder. I also use post-its to mark places in the text where I’d like students to stop and jot. This planning helps engage students in the text through opportunities to talk with their partners, write about their thinking, and extend their ideas about the text. Co-teaching requires a fair amount of planning and cooperation in order to really work well but it also requires trust, respect and spontaneity. We had a moment in the classroom that really provided a great example of the last three. Mel was teaching a reading lesson. She was showing the class how she uses her chart to help her identify the social issues in Drums,Girls, and Dangerous Pie by Jordan Sonnenblick, a book that we read as a read aloud. She had categorized social issues into three categories: individual, family, and community. As Mel began to model her thinking, I picked up her phone from her table and began taping her. This action had some unintended consequences in that most of the students listened a little harder than they may have otherwise (no one wants to be caught not paying attention on tape.) However, my spur of the moment video provided me a valuable teaching moment, as well. Many times, when Mel tells students to turn and talk, some of our students struggle to develop meaningful conversations. A successful conversation pre-supposes that they are attending to not only the question, but also the lesson leading up to the question. After Mel finished her demonstration, I turned off the camera and listened in on two pairs of students. Mel had asked them what they noticed about how she had used her chart to push her thinking. I had to remind them of the question and then help them along with thinking stems and sentence starters. Even then, by the time they got their conversation started, Mel was calling the group back together. When the mini-lesson ended, we still had over thirty minutes of reading time so I pulled the four students into a strategy group. I explained to them that we all have the potential to space out during a lesson and responsible learners develop strategies that help them focus. Together, we re-watched the two-minute demonstration that I had taped and I paused it a few times to have them jot down key observations they made. At the end, one of the students and I had a model turn and talk. Then, we all talked about how much easier it is to generate ideas and have a conversation if you have a few written bullets in front of you. My challenge to these students is to use this bulleting strategy during upcoming mini-lessons. I will be there to remind them and support them but my hope is that they begin to integrate this note-taking strategy to help them initiate and engage in more meaningful peer conversations. When we teach together and have so much trust in each other, we have opportunities like the one we had today. I would not spontaneously video all of the teachers with students I service. However, I did reflect on how this practice could be implemented in other classrooms. As our classrooms become more and more technologically oriented, our access to videoing equipment certainly increases. We have students in our classroom who would be more than willing to video for us. If we knew that we were about to teach a ten minute mini-lesson of a skill we really want all students to understand, what if we did ask a student to hold a camera? Then, we have the opportunity after the lesson, when other students are doing their independent work, to incorporate the video into a strategy lesson and review session for struggling students. If anyone out there has other ideas or ways they have successfully taped lessons, please share them! We'd love to hear from you! I read The Fault in Our Stars by John Green over the weekend with managed expectations since I have read amazing reviews about it. To say that I read it does not do it justice. I inhaled it, devoured it, admired it, loved it. On my walk, I was distracted and several aspects of my life suffered because I wanted/needed/was obsessed with finishing it. And now I miss it. The main character, Hazel, is the 16 year-old narrator and she has terminal cancer. She is honest, reflective, funny, and smart. She meets Augustus at her minimally helpful cancer support group and the book is about their relationship and infinitely (a reference to the text…) more. Sometimes I think I could write a novel, but then I come across one like this with authentic dialogue, laugh out loud moments, incredible literary references (shout-out and thank you to google as a way to look them up), symbols, life lessons, and scenes that had me crying so hard that I had to put the book down because the words were too blurry. I hurried to finish this book, not only because I wanted to know (even though there was a certain inevitability) what would happen to my literary friends, but also because I wanted to get it into my daughter’s hands so that I could have a non-virtual person to share this book with. As an elementary school teacher, I will not put The Fault in our Stars in our classroom since it is about a relationship between teenagers and there is at least one scene I wouldn't want my own fifth-grader to experience. That being said, I cannot wait to discuss this book with my older daughters, my husband, my mother, my book club--you get the idea. Enjoy it! Over the years, I have worked hard at creating a student-centered environment where students feel that it is “our” classroom. Part of creating this environment is using bulletin boards in a purposeful way to display student work, share strategies, and display charts for students to use. 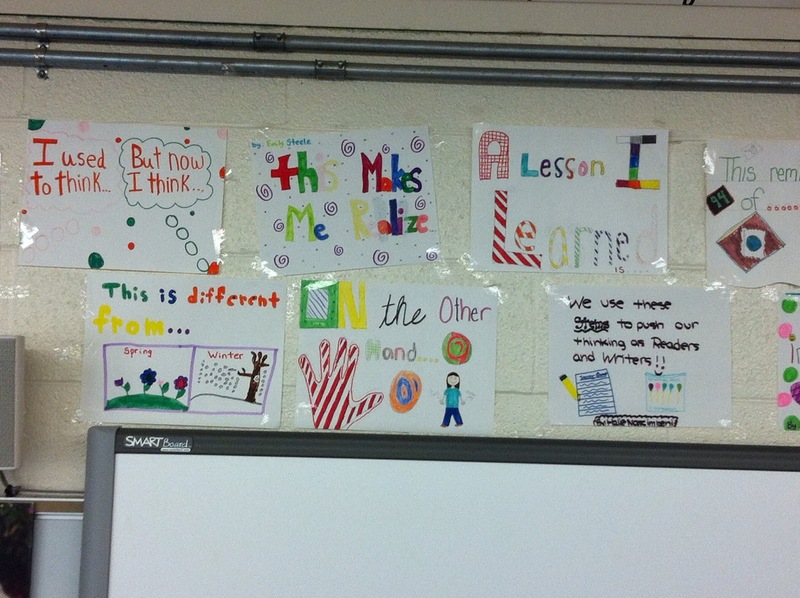 When you walk into my classroom, you will never see any store bought posters or charts from a teacher store. Instead, you will see bulletin boards and wall space covered with thoughtful charts, student work, and strategies we are working on in each subject area. 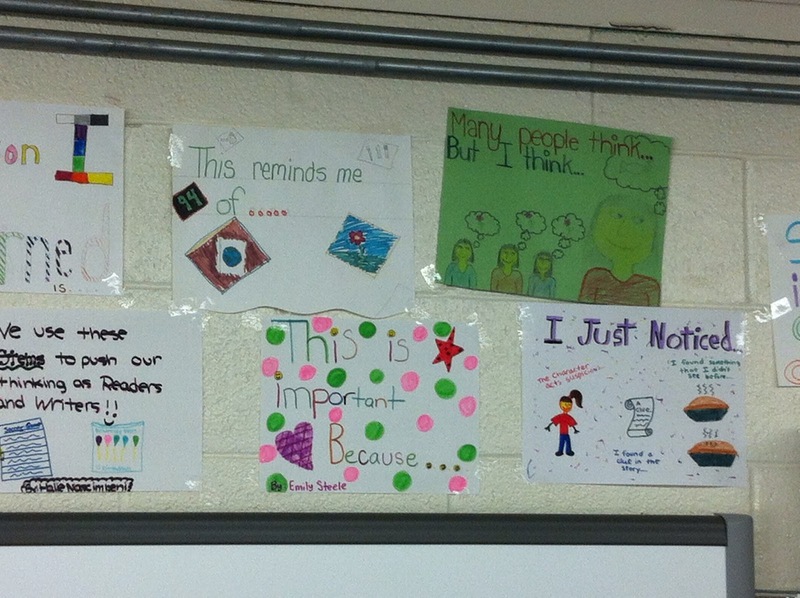 In my room, I have designated bulletin board space for various subject areas. When visitors walk in, it is clear which unit of study we are currently immersed in by looking at the labeled bulletin boards and student work. Both class and hallway bulletin boards are clearly labeled and revolve around student work and skills/strategies being taught in units. 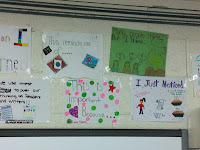 Students are involved in creating and maintaining the bulletin boards – this builds a sense of ownership and pride in students which causes them to refer to the charts, etc. :) Along with charts and strategies, students’ notebook entries and responses are posted to show the strategies they are using in their notebooks. Students write their name next to their work and also name the strategy they used. This is a great way for students to learn from one another! Recently, I had a conversation with my class about our bulletin boards for our upcoming units which are Poetry in writing workshop and Social Issue Book Clubs in reading workshop. I had students discuss at their tables how they envision using our bulletin board spaces for these upcoming units, along with still displaying their work in their reader’s notebooks. Each table had a thoughtful conversation and impressed me with their ideas of how to use the space for their own learning and work. The joint decision was that we would use the writing bulletin board to display their poems by posting them under the strategy heading that they used to write the poem (turning a notebook entry into a poem, observing an object, using a photo, making a list, using a mentor poem). They decided that we would divide our reading bulletin board space into five sections, giving one section to each book club group to use to display their thinking and share strategies they are using during their book club conversations. Last, but certainly not least, they pleasantly surprised me by deciding that they wanted each table to get their own foam board to use to create their own “mini-bulletin board” to display ways they are using their reader’s notebooks. I was so excited to hear this and will be making a trip to a store tomorrow to purchase foam boards for each table! I will share photos as soon as they create their mini-bulletin boards! In an earlier post, I talked about questions that lend themselves well to turn and talks. As the Special Education teacher in the room, I pay extra attention to the children on my caseload who frequently have issues with processing speed or organizational challenges. These students benefit from having a little extra time to gather their thoughts and verbally rehearse in their heads what they are going to say. However, I would venture to say that most students benefit from being cued to take some time before beginning a conversation. For example, “Boys and girls, how is this character’s behavior different from how he would have acted at the beginning of the story? Turn and talk, but first, take fifteen seconds and think about what you are going to say.” Maybe you will find that fifteen seconds is not enough or is too much. Maybe you will find that certain questions need more or less time. Public speaking has challenged me throughout my professional career and--full disclosure-- I am constantly rehearsing in my mind what to say and how to say it. Even as a second teacher in classrooms, I usually do a silent run-through of what I am going to say before I say it. Asking students to wait a few moments before talking will not take up much instructional minutes and the resulting conversations might be worth the time. During read aloud, as well as during other parts of the day, we ask students to turn and talk to each other. We all know that some students raise their hand and answer questions every time they get a chance and some students never volunteer. When we ask students to turn and talk, students practice organizing and verbalizing their thoughts and they also practice listening and asking questions. o Why do you think the character acted the way that he/she did? o What changes are you noticing in the character? o What message is the author teaching you through the events of the story or the changes in the characters? o What does this make you realize or think about people and life? o What do you predict will happen in this science experiment? o Talk about different ways you could organize the data. o What are some important features that graphs and tables should have? o How are squares, rectangles, rhombuses and parallelograms alike and different? When I think about how to evaluate whether a question is “turn and talk-worthy”, I try to imagine how I would answer the question. Do I have to stop and think about the answer? Could there be different “right” answers? If the answer to either of these questions is yes, then the turn and talk has the potential to be meaningful to students.